WSSI in the Community — Wetland Studies and Solutions, Inc.
Matthew Shepherd took action when he noticed smoke coming from a townhouse near our stream restoration project. In August, Ecosystem Specialist Matthew Shepherd was working on a stream restoration project site in Fairfax County when he noticed smoke coming from a nearby townhome. Matthew and the crew from Environmental Quality Resources quickly went door-to-door to make sure residents evacuated the adjacent townhomes before the fire spread. They called Emergency Services and thankfully no one was hurt. 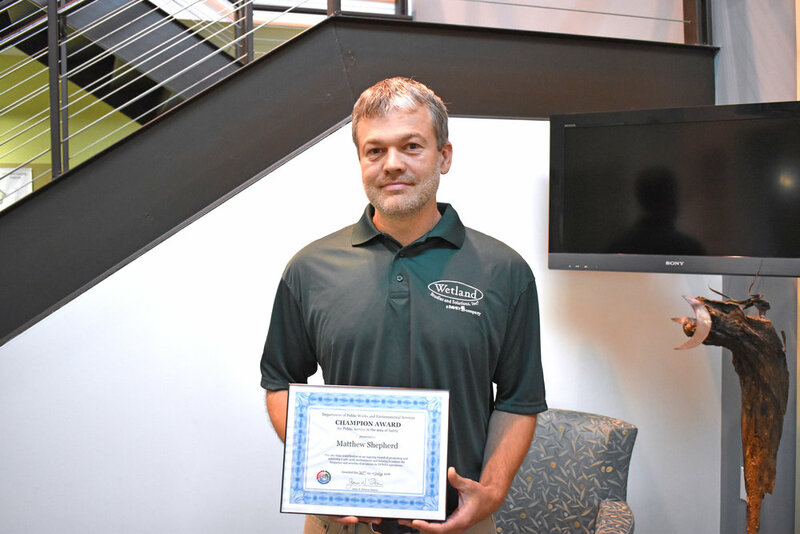 Fairfax County recognized his quick thinking and commitment to safety in the community by awarding him the Fairfax County Government Champion Award for Public Safety. Cornell University recognized Emily Beacham as Engineering Co-op Supervisor of the Year. For almost 25 years, Wetland Studies and Solutions, Inc. has maintained an ongoing internship program to engage college students in the natural and cultural resource industry. This year, Project Engineer Emily Beacham was awarded Cornell University’s Co-Op Supervisor of the Year for her role in mentoring engineering student Irene Sarri. Emily made sure Irene had a successful internship as she learned about water resource engineering and fully experienced the team-oriented culture of WSSI. WSSI senior architectural historian Penne Smith Sandbeck and her co-authors, Meg Greene and Barbara Snowden, received the Daughters of the American Revolution’s Historic Preservation Recognition Award for their book, The Goodliest & Most Pleasing Territory: A Building Survey of Currituck County and the Northern Outer Banks. The award recognizes outstanding achievement in historic preservation, and is sponsored and presented by Virginia Dare Chapter in Kill Devil Hills, NC and approved by the National Society of the Daughters of the American Revolution. The Virginian-Pilot wrote about the book when it was published last December. In September, the Virginia Department of Game and Inland Fisheries (VDGIF) Office of Professional Standards (O.P.S.) awarded WSSI founder and President the O.P.S. #4 Protector Challenge Coin. As part of the inaugural group of 24 recipients, Mike was recognized as a “Wildlife and Natural Resources Protector” for his longstanding support of the Agency Mission, and his commitment to aiding and assisting the efforts of law enforcement officers. Mike was nominated by the Prince William County law enforcement district of VDGIF. You can read more about the O.P.S. Protector program here. Virginia Conservation Police Officers presented Mike Rolband with the Protector Challenge Coin to recognize his commitment to the Virginia Department of Game & Inland Fisheries’ mission and work.